$8,750.00 Medal of Hero of Romanian Socialist Republic, Type 3 in solid gold with imitation diamonds and imitation ruby. One of only 10 of this type ever made. Extraordinary piece! $2,950.00 State Prize Medal, 1st cl., in 22 K gold, with original fitted case of issue. The medal is in outstanding condition. Only 50 of the First Class medals in gold were ever awarded. $4,500.00 Order of the Star of Romania, 1st cl., RPR issue, Type 1, Variation 1 breast star in silver, 1947. Exceptionally rare piece: one of only 10 of the large size silver gilt version ever issued. In excellent condition. $1,950.00 Order of the Star of Romania, 1st cl., RPR issue, Type 1, with original fitted case of issue and ribbon bar. This bronze gilt version was reportedly issued for only one year circa 1956. In excellent condition. $7,300.00 Order of the Star of Romania, 1st cl., RPR issue, variation in non- hallmarked 14 K gold adorned with genuine diamonds, with original fitted case of issue, 1962-65. This piece is among roughly 40 to 50 RPR Orders of the Star 1st cl. in non-hallmarked gold ever made. A superb award in near mint condition. $4,995.00 Order of the Star of Romania, 2nd cl., RPR issue, first version in 14 K gold adorned with genuine sapphires, with original leather case, 1962-65. This piece is among roughly 75 to 100 RPR Orders of the Star 2nd cl. in gold without hallmarks ever made. A superb award quality wise, in excellent condition. 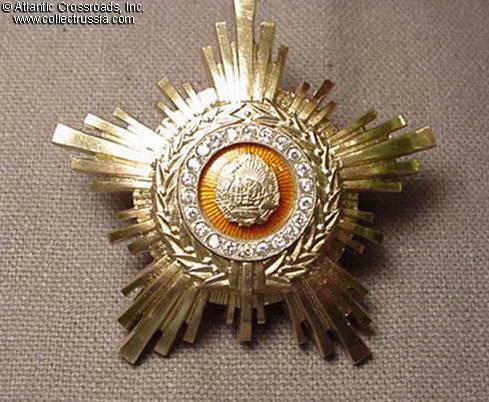 $225.00 Order of the Star of Romania, 3rd cl, RPR Type 2, Var.1 (non-hallmarked), circa 1964-65. Beautifully made piece in solid silver and imitation diamonds, in excellent condition. $35.00 Order for Military Merit, 2nd cl, RSR issue, 1965 - 1989, with original fitted issue box	and ribbon bar. In excellent condition. $1,600.00 Order of Labor, 1st cl., RPR, early "simple pinback catch" type in silver, with original case of issue and award document issued in December 1955. In excellent condition. $1,300.00 Order of Labor, 2nd cl., RPR, early "simple pinback catch" type in silver, Variation 1 (numbered), #6, with original case of issue, circa early 1950s. Note the exceptionally low single-digit serial number! An extremely scarce piece in superb condition. $50.00 Order of Labor, 3rd class, RSR issue, 1965-1989. In excellent condition. $1,850.00 Order for Sport Merit, 1st cl., 1966 issue with the wreath and center medallion made in solid 14 K Gold. In excellent condition. Very scarce, one of approximately 100 made. $10.00 Medal for Military Merit, 1st cl., RSR issue. In excellent condition. $40.00 Medal for Military Merit, 1st cl, RPR issue, early 1960s. $30.00 Medal for 20th Anniversary of Liberation from Fascism, with original fitted case of issue. $10.00 Medal for 25th Anniversary of Liberation from Fascism, 1969. $40.00 Medal for Contribution to the Collectivization of Agriculture, 1962.